With student loans now the second-largest source of debt in US households and the student-loan-debt rate growing faster than all other sources of borrowed money, one may argue the last thing college students need is somebody else offering up-front cash for principal and interest down the road. But hey, a kid’s gotta get to the Rose Bowl, right? 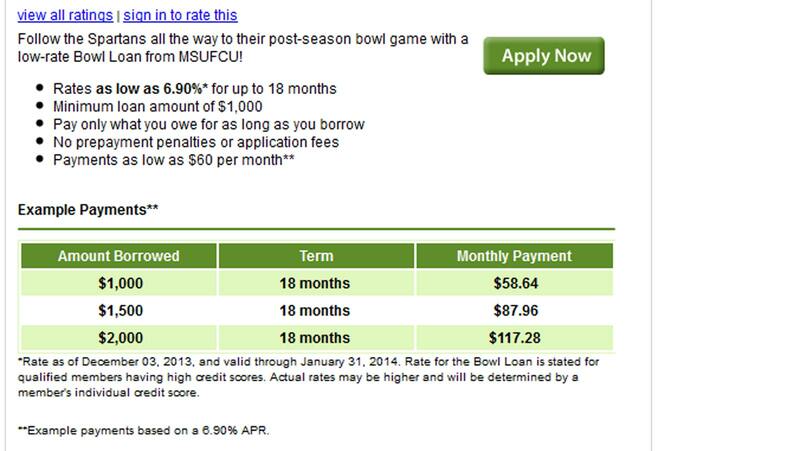 The Michigan State Federal Credit Union, responding to a football team that just won the Big Ten and made the Rose Bowl, coupled with a student body strapped for cash and looking to get to Pasadena, Calif., is offering a "Bowl Loan" with an interest rate as low as 6.9 percent for 18 months to help fans get to the big game against Stanford on Jan. 1. The loans must be at least $1,000 and come with no prepayment penalties. So, in theory, this one shouldn’t break the bank.